The Women’s Tribute Memorial Lodge is a significant building, developed as a veteran’s memorial with funds raised by the women of Manitoba. The Lodge was conceived as a symbol of gratitude and remembrance for those who served in the First World War. Constructed in 1931, the building was not just a monument, but a living memorial containing an auditorium, games room and a special space called the Room of Silence. These facilities were used by the veterans from the Great War to help them continue with their lives, and as a commemorative space to remember all those that had served their province and country. 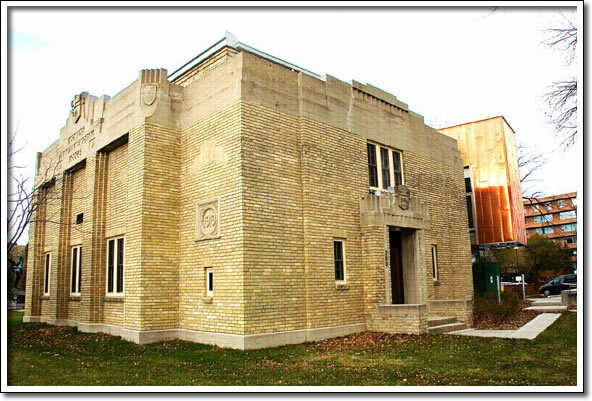 Designed by prominent Manitoba architects George W. Northwood and Cyril W. U. Chivers, both of whom had served in the First World War, the Women’s Tribute Memorial Lodge also is a rare Manitoba example of the Art Deco style of architecture. With its basic cubic form, crisp edges and effective geometric decoration, it is an exemplary example of the style.